And in this he showed me something small, no bigger than a hazelnut, lying in the palm of my hand…. Sin is necessary, but all will be well, and all will be well, and every kind of thing will be well. And so our good Lord answered to all the questions and doubts which I could raise, saying most comfortingly: I may make all things well, and I shall make all things well, and I will make all things well; and you will see yourself that every kind of thing will be well. For I saw most truly that where our Lord appears, peace is received and wrath has no place; for I saw no kind of wrath in God, neither briefly, nor for long. And I saw no difference between God and our substance, but, as it were, all God; and still my understanding accepted that our substance is in God, that is to say that God is God, and our substance is a creature in God. For the almighty truth of the Trinity is our Father, for he made us and he keeps us in him. And the deep wisdom of the Trinity is our Mother, in whom we are enclosed. And the high goodness of the Trinity is our Lord, and in him we are enclosed and he in us. We are enclosed in the Father, and we are enclosed in the Son, and we are enclosed in the Holy Spirit. And the Father is enclosed in us, the Son is enclosed in us, and the Holy Spirit is enclosed in us, almighty, all wisdom and goodness, one God, one Lord. I love Julian. Thank you for highlighting her feast day. She has been and continues to be an important guide and voice for me. Julian’s “all shall be well” prayer is one that has aided me in times of pain and difficulties. I understand. “The Julian prayer,” as my younger son called it, has sustained many of us. The way to happiness indeed: until I am attached to God that there shall be no created thing in between my God and me. It makes sense for then I am truly whole…no longer broken. Thank you for this. You are most welcome Katie. I think our wholeness in God allows to engage the created world in a new way. Here is a link to another blogger’s about Julian. Great post Fr., I like her idea of sin as being a stepping stone into the holy life! 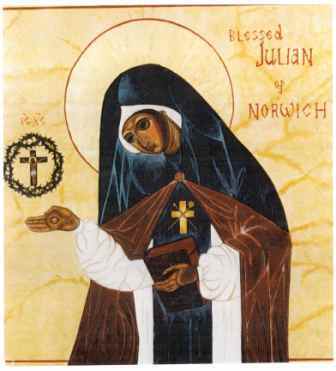 Julian of Norwich was/is not a Saint! She is venerated in the Anglican and Lutheran Churches, but has never been canonized or officially beatified by the Catholic Church. So to call her Saint Julian is incorrect. I am a Benedictine Oblate and have taken Julian’s name as my Oblate name. Yes, you are correct. Julian is not a saint in the Roman Catholic calendar. Forgive me for causing any confusion. Excuse me. But I think there are lots of saints who have not been canonized. Thanks Wayne. I still refer to Julian as St. Julian. The Episcopal Church and Roman Catholicism have different processes for recognizing “saints.” Saints, for me, are about a life lived, not a process completed. hmmmmm just read that Julian of Norwich is not a canonized saint in the Roman Catholic Church…whatever happened to the Communion of Saints and how many Saints are there that were never canonized…is it Important. Are the Apostles all canonized saints…just curious. And when did canonization come about?? We certainly called Christopher Saint for the longest time….such a tiny issue in the scheme of things…we only see a sliver, not the whole picture. Thanks for your witness and for Toolah’s post but if he has taken her name in the Oblate Order he has to really believe in his heart that she is a saint. And, are there not Saints in the Episcopal Church and the Orthodox Church that are not Saints in the Roman Church. oppps my mouth runneth over..
Nadine, you raise a good question. I think the Communion of Saints is much larger than any calendar or canonization process. The Biblical understanding of saints is that they are the people of God. Yes, the Orthodox, Roman Catholics, and Episcopal Church share many saints but also each recognize saints that the others do not. That one calendar does not include a person as a saint is not necessarily a denial of their “saintliness” but may be more about history and context. Julian is celebrated in the Episcopal calendar on May 8. I am certainly no expert on the canonization process. I think, however, that the Roman process is more formal and strict than either the Orthodox or Episcopal process. Thanks for that. Would have loved some quotes about God as mother…so central to understanding her! And so important for understanding, today, the image of God in women. Yes, she has some beautiful and important feminine imagery for God.